Successfully Added 1 To 4 HDMI Splitter - 4K Resolutions In HDR, HDMI 2.0, Dolby Audio, 3D Content Support, Fanless to your Shopping Cart. Supports 4K resolutions in HDR as well as 3D content so you are equipped with future-proof technology. This HDMI splitter would be of particular use to a sports bar or large home where you want the same content displayed on several screens across a number of areas. Designed for power users this HDMI splitter with its single input and 4 HDMI outputs can easily content with 4K graphics, 3D content and all manner of audio formats. This HDMI splitter lets you clone an HDMI input to 4 other HDMI cables, this means you can share the signal from your TV Box, Blu-ray player or any other HDMI devices to 4 other screens. LED lights display which ports are active and the high bandwidth and baud rate let you effortlessly share rich content between multiple devices. Now you can take the signaled from your games console or PC and show it on a monitor, your TV and even a projector all at the same time. This HDMI splitter can handle 4K resolutions at up to 60Hz so it's ideal for rich visuals such as blue rays and gaming. With HDMI the audio as well as the visuals are shared and with Dolby Audio supported this splitter will send high-quality audio to each of the 4 outputs letting you create a seriously impressive sound system to accompany the 4K resolutions. 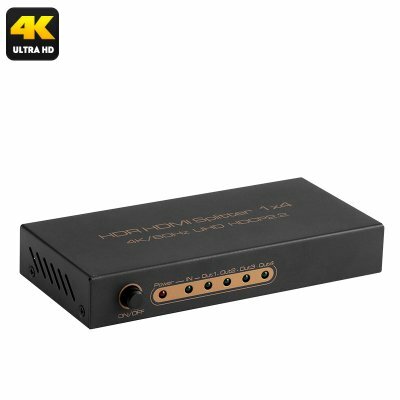 1 To 4 HDMI Splitter comes with 12 months warranty, brought to you by the leader in electronic devices as well as wholesale home video solutions and cool gadgets..